Ed’s Garage is a very amiable, idyllic multi-actor comedy by the same team that has brought the wildly successful Wingfield plays over the years--playwright Dan Needles, director Douglas Beattie and actor Rod Beattie. Needles has been exploring the area we might call “Wingfield Country” via other multi-actor plays such as The Perils of Persephone (1989) and The Belles of Larkspur (2003). What a multi-actor play loses is, of course, the sheer virtuosity of Rod Beattie, who often plays more than 20 roles in the solo Wingfield series. What a multi-actor play could gain is an increase in drama through dialogue, rather difficult to do if one actor has to play both parts. Strange to say, Ed’s Garage (2006) doesn’t take full advantage of this possibility and tends to fall back on a narrative structure more familiar from the Wingfield plays. Ed’s Garage is set in Port Petunia, a town we’ve heard mentioned in the Wingfield plays. It’s close enough to Walt’s home turf to be served by the Myra Connor (“I’m a goner” to the locals) Nursing Home that featured in Wingfield Lost & Found (2010). The garage, created in exquisitely realistic grungy detail by designer Dana Osborne and beautifully lit by Steve Lucas, functions as much more than a garage. It is the town’s community centre, gossip exchange and healing spa. All this is due to the wisdom and natural gifts of Ed (Rod Beattie), who knows not only how to fix cars but how to fix people. Aided by his former enemy-turned-trusty sidekick Nick, (Douglas E. Hughes), Ed deals in common sense advice and in cures for mental distress that he’s picked up here and there. The potential for conflict arises when we learn that the cottage Ed rents has been taken by Cassandra (Adrienne Gould), an accredited psychotherapist, who plans to set up shop in Port Petunia. A further conflict is possible when Peter (Tim Campbell) takes his truck to the garage for a check-up and Nick and Ed assume his morning therapy session is with Ed. Ed proceeds with his eccentric techniques--including head tapping, mantras and deliberately infuriating assignments to help Peter with anger management issues--when Cassandra appears and all realize that Ed has inadvertently stolen her client. What’s worse, Peter decides that he’d rather continue treatment with Ed than start again with Cassandra. The potential for conflict is there, but Needles tamps it out as soon as it arises. Cassandra’s not upset with Ed and, in fact, is curious to observe how his non-traditional techniques work. The problems that impinge most on the lives of the four characters all occur offstage--tracking down the thief of Cassandra’s barbecue, Ed’s cow suffering through a difficult birth and, at the climax, a recreation on the local river of a “famous” battle in the War of 1812. All of these exciting events are narrated on stage, with the narration divided among the four characters. As we know, Needles is a master of comic narrative description and these sequences abound in humour. 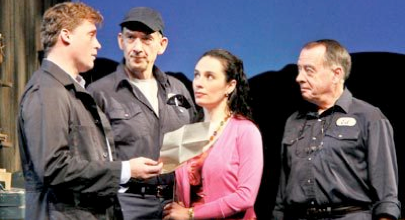 None of their humour, however, springs from conflicts among the four characters on stage. What comes closest to this is Peter’s falling in love at first sight (Needles does present an idyllic world) with Cassandra. Needles again prevents conflict by showing us that the feeling is mutual. The problem between the two is primarily bureaucratic. A judge has required Peter to have anger management sessions from an accredited psychotherapist with a signature to prove it. Even if Peter were to switch to Cassandra, it would unethical for her to treat a client with whom she has a personal relationship. What can they do? Needles does not require a deus ex machina since he already has the character of Ed and his preternatural powers of problem solving. Such a character guarantees a happy ending. What little suspense there is concerns not whether the problem will be solved, but how. Ed’s Garage is fairly peculiar in terms of its characterization. The person we know most about is Peter, who has to explain his whole backstory to Ed as part of his therapy. Next is Nick, who relates the great change that came over him when he became converted to Ed’s way of thinking. We know quite a lot about all the good things that Ed does, but why he is the way he is and how he came to develop his gifts remains a mystery--perhaps intentionally so. The character we really need to know more about is Cassandra. When asked about her past, she says she doesn’t want to discuss it, yet something major must have happened in her life to make her move from the city to the country. If Needles had wanted to, he could have given Peter and Cassandra painful pasts that they would need to overcome to form a relationship. At least, if there are no real external conflicts there could be substantial internal conflicts and with Ed, Needles has the perfect sounding board for them. The fine performances of the entire cast certainly helped to lend a fuller life to their characters. Rod Beattie seems to pitch his performance between the wise character Don of the Wingfield series and that of Walt Wingfield himself. Hughes is ideal for this kind of comedy, a very believable country fellow full of enthusiasm and respect for those who help others. Campbell is hilarious as an initially confused young man who grows in confidence throughout the action. Gould, through force of her charming personality, makes Cassandra’s acquiescence to Ed’s world seem perfectly natural and in her manner she hints, beyond anything in the text, at an unhappy past that she is hoping to overcome. Douglas Beattie directs the play with his usual finesse and attention to detail, with movement down the auditorium aisle and back helping to establish with impressive flair the proximity of Ed’s Garage to the local river. I must mention that the Saturday matinee audience seemed totally unconcerned with the general lack of conflict in the show, happy to see a nonthreatening story told well. Ed’s Garage falls into the category of comedies, like Shakespeare’s As You Like It, that please not through averted danger or satire but through the depiction of the pleasures of those lucky enough to live in an ideal world. Most comedies, however, even Shakespeare’s don’t follow this pattern. The lovers in A Midsummer Night’s Dream and in Twelfth Night find themselves in some pretty knotty situations. The problems that develop in Molière’s Tartuffe or The Misanthrope appear nearly insoluble. It would be interesting to see what would result if Needles allowed himself to explore in greater detail the conflicts among his characters rather than to resolve them so easily. His multi-actor plays would be all the stronger for it. Photo: Tim Campbell, Douglas E. Hughes, Adrienne Gould and Rod Beattie. ©2012 Craig Glover.